As Bugs Bunny and Porky Pig used to say at the end of their cartoons - That's All Folks! for this year's Breeders' Cup. 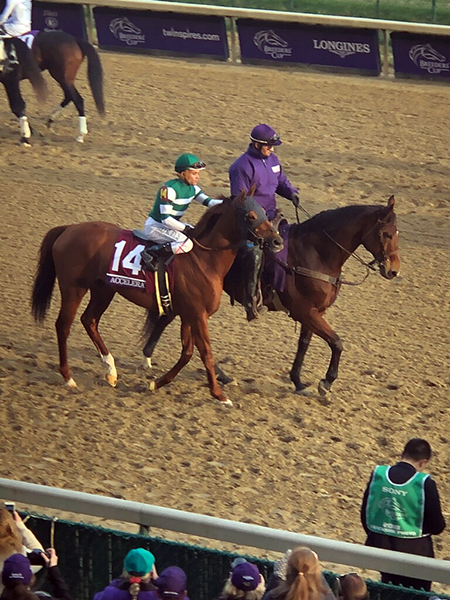 ACCELERATE closed the show with a race he probably won at the start. He left the other 13 horses stew in the gates for a bit before loading. When the doors finally opened, there was a ton of banging inside that put a lot of the other contenders in a bad spot from the jump. 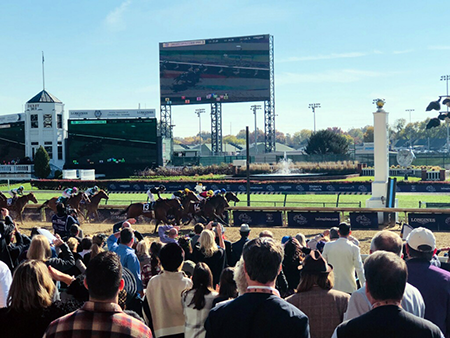 Briefly recapping the day's Breeders' Cup action, our top pick won six of the nine Breeders' Cup races. Considering the depth and quality of the fields - we'll take it. 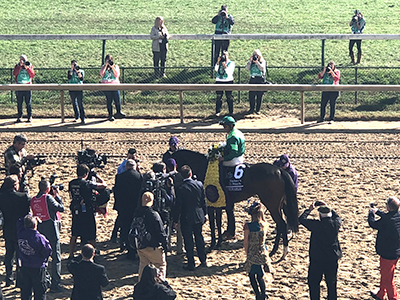 We hope you cashed in using our picks and wagering guide and we'll see you next-year at Santa Anita for the 2019 Breeders' Cup! Until then, check out our daily picks and best of luck wherever you end up getting your selections. We might as well end the show with what looks like another good Dutch Win Bet Wager. Using the top four horses according to current odds with 10 minutes to post. Here�s the $40 play. 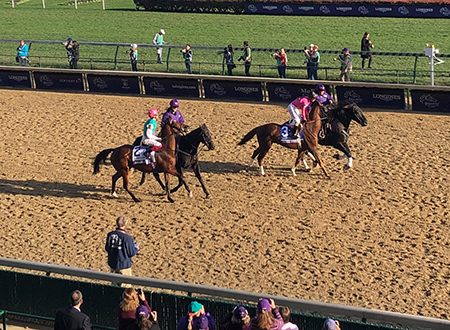 In the most expected result, ENABLE won the Breeders' Cup Turf, but probably not as easy as most thought as our fourth pick MAGICAL gave ENABLE all she could handle down the stretch. Both horses were way wide but managed to pull way from the pack. SADLER'S JOY got third and our first alternate pick ARKLOW pulled up for fourth at 53-1. A $26.80 exacta for our tipsheet customers is respectable with everybody�s favorite taking the Win. 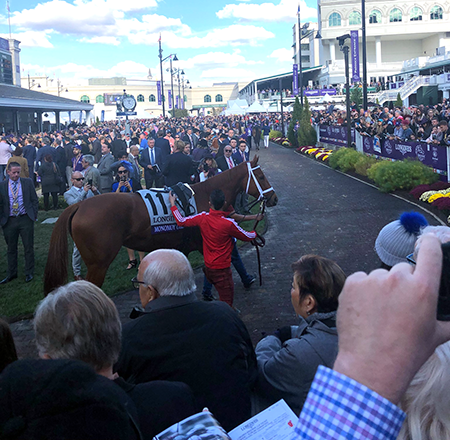 After all the anticipation and hype, there is just one race left - The $6 Million Breeders' Cup Classic. That's better, back on top with MONOMOY GIRL running a big race, following up her Kentucky Oaks win at Churchill. Our fourth pick, WOW CAT came from last to a hard charging second. Had CAT started a little sooner, she might have got there. MIDNIGHT BISOU (our second selection) really pushed hard in the final strides to get third, passing one of our alternate picks BLUE PRIZE for third. Our picks paid the $2 exacta for $37.60 and the $2 trifecta for $180.20. In the 10th - it's ENABLE versus the field in a Breeders' Cup Head2Head wager. Although we believe, like everybody else in the world, ENABLE is likely to win, implied odds say to play the Field. OSCAR PERFORMANCE had a stutter step start, came out dead-least and probably changed the complexion of the race as he usually likes to be upfront. EUROPE gets the Head2Head win with EXPERT EYE taking the tape. Our third-pick ANALYZE IT had to do the heavy-lifting upfront and just didn't have the legs to get to the line first, finishing third behind our fourth selection CATAPULT. The BREEDERS CUP MILE is a perfect race for a Dutch Win Bet with the current favorite at 3-1. Using $20 and the top three in terms of current odds; Here's how to split it up. If any wins, it would generate a profit. ROY H, our top-pick makes it three in a row for our top-choice as he defended his BREEDERS CUP SPRINT title. Check this out - we had the top five picks in exact order in a nine-horse field. We hit the cold $41.20 exacta, cold $125.20 trifecta and cold $361.00 superfecta. Had someone played our top 5 picks IN ORDER they would have cashed the lone $66,000 super high five ticket in that race. Not sure we can do it any better than that! Going to grab some pizza now to celebrate! Chalk it up as a win for TEAM USA! In a super slow, early pace race, our top-choice SISTERCHARLIE went wide mid-race and out sprinted our second pick WILD ILLUSION to the finish-line. Perhaps ILLUSION's reluctance to enter the gate cost her late. Our first Alternate Pick (who lives up to her name) A RAVING BEAUTY tried to lead the field from beginning to end but got a little leg-weary late to finish third. Rounding out the top four was our fourth pick MAGIC WAND. 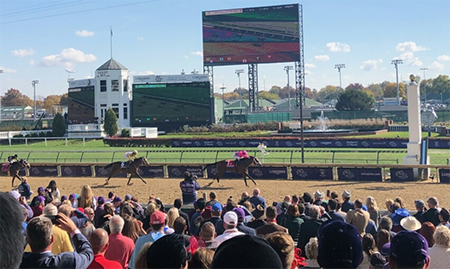 The $2, cold-exacta paid $37.20 for a 18X PROFIT while our PRO subscribers also hit the $301.60 trifecta using our wagering guide recommended plays. A nice $2 pick three payout using our 3rd, 1st, and 1st picks paid $263. 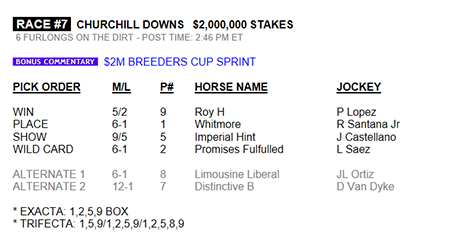 We'll try to keep it going in race 7 - THE BREEDERS CUP SPRINT - a race that we think as many as five horses can win. The early money is coming in hard on Wild Illusion, bet down to 3/2 from 7/2 with 15 minutes to post. It's often said the smart-money (if there is such a thing) bets early. One other quick note on early betting, sometimes people use a technique called spoofing in the financial world. They bet heavy early to affect the early-line trying to influence the crowd via favorite bias. Meanwhile, their real money is elsewhere, at the last minute they pull the early bet money by cancelling the ticket. Watch to see if WILD ILLUSION'S odds jump higher as the horse head towards the gates. As the TV announcer put it, our top-choice CITY OF LIGHTS DOMINATES the DIRT MILE In race 5. He smoked the opening quarter mile in 22 and change, was challenged a touch out of the turn, but turned on the afterburners going home. We had the exacta cold with SEEKING THE SOUL taking second for a $44.40, two-dollar COLD exacta and a 22X PROFIT. Maybe the panting we noted for the favorite CATALINA CRUSER did mean something as he broke wide out of the gate and finished out-of-the-money. On to the first Head2Head matchup in the FILLY AND MARE TURF. Our pick? USA, USA... you can read why here. Race 5: UPDATE Not sure if it's her normal behavior, but it sure looks like the favorite CATALINA CRUISER is panting, perhaps overhyped in the paddock. Keep an eye on that. STORMY LIBERAL and WORLD OF TROUBLE battled it out down the stretch, neck and neck for the last two furlongs. STORMY LIBERAL edged past WORLD OF TROUBLE at the wire with DISCO PARTNER well behind taking show money. The trio made up our top three picks with the STORMY LIBERAL paying $16.00 to win. We also had the $55.80, two-dollar exacta and $230.60, two-dollar trifecta. We hope all of you had it. Here's to trying to do the same or better in race 5 - BREEDERS CUP DIRT MILE. We'll see if speed can hold up in the MILE as the race doesn't have a lot of natural front-runners. 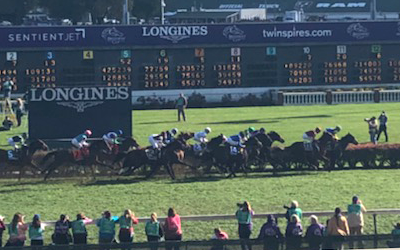 Day two of Breeders' Cup races starts with a 25-1 on top as #14 SHAMROCK ROSE beats our fourth choice CHALON by a nose whisker in a four-way photo finish. ANONYMITY and post-time favorite MARLEY'S FREEDOM round out the top four. Unlike yesterday, speed didn't not hold up as our top-choice SELCORT blazed out of the gates in under 22 seconds in the opening quarter, way too fast. There are no scratches in Race 4 - BREEDERS CUP TURF SPRINT. If the odds stay as they are, a Dutch Win Bet might be smart win bet strategy. We'll let you know about 10 minutes before post-time.